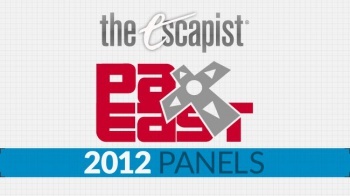 PAX East 2012: Stuff Your Criticism, I Want a Review! A panel of industry experts sound off on the difference between a game "review" and a game "critique." There are harder things to do in this world than find someone else's opinion on a videogame. Many harder things. Various online and print media sources are practically shouting for the public to hear or read their particular brand of judgment and, sometimes, as a consumer, it can be difficult to seek out those sentences that embrace the feel, detail, and purpose that you're hoping to discover. Such is the balance that PAX's "Stuff Your Criticism" panel sought to explore alongside an audience packed with the gaming public. First Person's Dennis Scimeca began the discussion by examining the history of gaming reviews, and the shift from the then-standard "this is why you should buy this game" write-ups of the PC-dominant era, and the gradual shift toward the "critique," a more meditative look at the raw experience that began near the release of Sony's PlayStation One. Scimeca argued that this is the point we began to view games differently, and as such, need to now explore how we review them as well. He then opened the discussion to the panelists with a simple question: "Is there really a difference between review and critque?" Susan Arendt, the Escapist's own managing editor, pulled a table microphone close, cocked an eyebrow, and answered with a succinct but sufficient, "uh ... yuuup." A hearty laugh from the audience seemed to support her sentiment, but she expanded on the thought just the same. A critique, she said, is an examination of whether a game lived up to its potential, not the answer to, "will you enjoy it." "Reviews are best before you play," added Mitch Krpata, game reviewer for the Boston Phoenix. "Critiques are for after." A critique usually requires a gamer to understand certain details of the game before understanding the reviewer's thoughts, he further explained. Still, while it's important to understand the difference in review style and content, Arendt was quick to point out that the classifications writers assign to their work--review, preview, feature, editorial, critique, etc.--are more helpful for the author than the reader. Readers, she said, ignore those labels. So if these differing styles impact the writer, how does he or she choose which is most appropriate for the piece, quizzed Scimeca. Does the game itself sopmehow demand one or the other? Krpata was quick to answer him. "Good criticism makes you appreciate something," he said, "even if you wouldn't like it." From Krpata's answer, Scimeca drew the following point: A good review, then, will describe the experience, and allow the player to judge if it's an experience he or she would like to participate with themselves. Yet, a mere description of a game is dull; the nature of review is opinion-oriented. Can a writer then hope to express personal thoughts without falling prey to individual bias? "Many people 'fake' neutrality," answered Krpata. "But everyone is biased." "If you want an objective review, look in a game manual," joked Kyle Orland, senior gaming editor at Ars Technica. "A jumps, B shoots." "Bias is not a 'flaw'," added Arendt. "It's human." So, what then is the responsibility of a reviewer? Should they seek to explain games mechanically, coldly judging the playability while seeking to answer the question, "should you buy it?" Or, is what the panel described as "critique" more in order, a human, qualitative assessment that will do less to help guide the consumer's purchase than reflect upon an abstract experience? The answer, the panel explains, lies somewhere in the balance of an author's readership, and the economic realities that guide publication. "The culture of criticism is a risk," Orland said. It's more expensive to hire one "superstar" reviewer who truly understands the art form, than to farm out every single published game to an army of "sixteen-year-olds who can pump out dry reviews." The second option, he explained, tends to make more money while eschewing the artistic integrity of the piece. Publications need revenue to keep producing reviews, while also needing to please the readership with quality content. The end result is a difficult juggle, so how exactly does a publication hope to navigate the balance? "What readers say they want, and what they need are often different," Orland continued. "And economically, it's very hard to subsist on 'critique'." "I just write for an audience of me," added Krpata, "and just hope there are others out there like me." Chris Dahlen, co-founder of Kill Screen answered that he focuses on bridging the divide, explaining that the most important thing is to "bring people in who don't like games, while exposing those who do like games to other content." So where is that line between "review" and "critique"? Mitch Krpata took the final word: "It's hazy."